The first few hours after a storm hits your area is one of the most difficult. The first things you need to do is make sure your family is safe and that you have a roofing contractor that provides storm damage restoration services. Storm damage restoration is much more than just fixing a damaged roof. The aim of storm damage restoration is to provide a quick, long-term solution for roofing damage. In the beginning, your roofing contractor might provide temporary roofing such as a full-house tarpaulin cover, which is used to provide shelter and minimize further damage. Once the weather clears, a full inspection will be conducted. This takes into account leaks and wind damage as well as less obvious signs of impact damage. Conducting all of this requires know-how of complete roofing systems, which is why you should only leave storm damage to experts like us. During this time, itinerant contractors, commonly referred to as “storm chasers”, might come knocking at your door and offer their services. These people are not licensed to work on addressing storm damage and are unlikely to provide long-term solutions. Also, working with them could reduce the chances of a proper insurance payout and might even void your warranty. Part of storm damage restoration includes working with your insurance provider in compensating you for the repair cost. Once you inform your insurance provider about your situation, they will send an insurance adjuster to verify your claim. They will require accurate documentation of the damage as well as a quotation of the repair costs, and this is where your storm damage restoration experts come in. We will work with your insurance adjuster to make sure everything is included to ensure you get proper compensation. Your insurance provider will then issue your insurance payout, minus deductibles, as two checks. The first is basically the downpayment, while the rest covers the remainder of the work. It will be as if you’re getting a new roof. You will have the assurance that when the next storm comes around, you know you’ve already dealt with the worst. 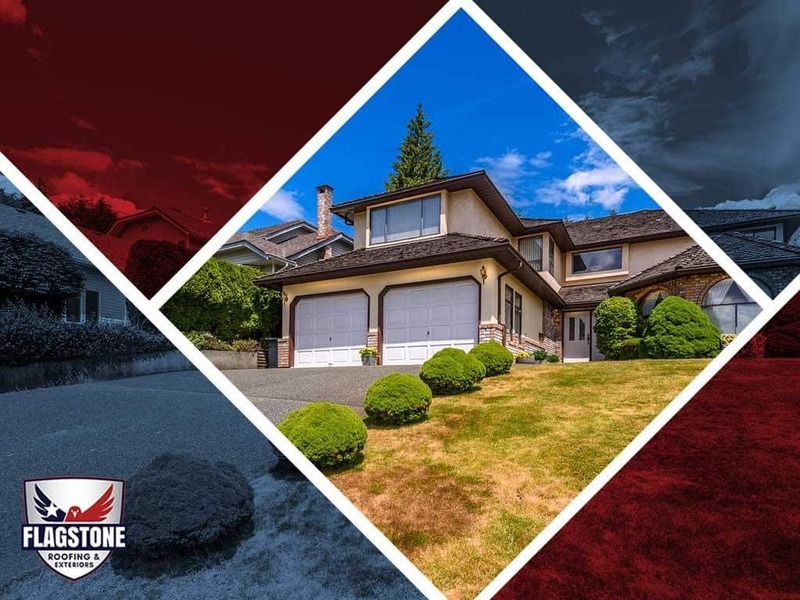 In addition to addressing storm damage, Flagstone Roofing and Exteriors is a home improvement company that can also address damage to windows and siding. Call us today at (855) 232-6386 or fill out our contact form to schedule a free in-home consultation. We serve many areas in and near Houston, TX.